Did you know it’s possible to eat a nutrient-dense diet of whole, living, and fermented foods and still be malnourished? If your gut isn’t operating optimally, you won’t have all the benefit of those wonderful foods you’re eating. That’s why so many have found the GAPS diet protocol helpful. It’s a restrictive diet, like the Specific Carbohydrate Diet, but it emphasizes eating nourishing foods that are proven to promote gut health — including homemade bone broth and lots of lacto-fermented goodies like sauerkraut. The GAPS diet is a healing diet. You probably wouldn’t want to eat it forever, but many people find that within 6 months to a couple of years on the GAPS diet works wonders for their overall health and well-being. Autistic children return to functioning normally. People with diagnosed mood disorders experience a level of stability they’d never thought possible. And digestive problems? Totally gone. This week, I’m pleased to be giving away the very first cookbook created specifically for those attempting to reclaim their health by eating GAPS-approved foods! It’s called Internal Bliss. Don’t you just love that title? It conjures up images of a supremely happy internal population of bacteria and yeast. With more than 140 GAPS-approved recipes, you won’t be disappointed! 1. The first step to entering the contest is to click on the link below. You’ll be taken to the GAPS Diet website, where you can learn more about the GAPS Diet protocol. Then, come back here and leave a comment letting me know one thing you learned from perusing the site. This contest will end Tuesday, December 14th at 11:59 PM PST. Winner will be announced the following Wednesday. Please note this contest is only open to those with U.S. shipping addresses. I signed up for your newsletter and visited the GAPS website. I have learned from the GAPS website that many neurological conditions begin in the gut and they can be healed through healing the gut. I even copied and “shared” on facebook! I suffer IBS/mucous colitis with flares once or twice a year. I am eager/anxious to learn more about GAPS. The 1-7 stool classification chart is helpful. I often read and share posts on facebook. I have signed up for the weekly updates. Looking forward to learning more and more. I liked and have been following you on facebook, even share . . . posts and links often. I cannot learn enough to help resolve my gut & psychology issues. It is the practicing them that will be the difficult part! I’ve been to the website before. Lots of great info. It’s amazing that we can heal our tummies in just a year or two, instead of spending the rest of our lives avoiding those foods that make us sick. Trying to get some good real foods cookbooks to work with and this one sounds great! I’ve spent a lot of time at that website as well, but I learned about the sensitivity test this time… interesting. I might give it a try. Also, how do I sign up for your newsletter? I don’t see anywhere to do that! I would love to win this cookbook! Thanks! The GAPS diet is amazing! I’ve never felt as healthy as when I was eating that way. I went back to the website, and was reminded to only eat fruit in-between meals. I follow you on FB. What I learned from the site was that homemade yogurt could be eaten immediately, which I didn’t know. Dr. Campbell-McBride set up The Cambridge Nutrition Clinic in 1998. I learned that it would be very difficult for my vegetarian daughter to go on this diet but that it would likely be very good for her. I mean your email newsletter! I already follow you on FB – that’s how I learned about this giveaway. I had no idea what the GAPS diet was about, and now i have a bit more understanding…no grains, sugars, or dairy, except for fermented items like yogurt. I learned that the good life of enjoying food doesn’t end just because you can’t have certain foods , in fact, the good life just begins and gets better! I;m a regular on the Gaps website, this is a great resource. Thanks. I follow on FB #2.. I was surprised to learn from the website that Arrowroot powder is a no-no. I always that it was a better choice. I can see, I have much to learn. I am subscribed already for the newsletter. Thank you! I love it! The website is a great source for healing your gut-so much information! at the GAPS website i learned that probiotics are useful for a whole lot of health problems, not just digestive issues. And this has been demonstrated thru studies, not just anecdotes–who knew? and, I signed up for the newsletter! I have learned that many deseases are being linked to gut health. I subscribed to your newsletter! Thank you for all of this information! I learned how important it is to consume homemade bone broths…. GAPS diet helped me immeasurably with eczema issues. Been dealing with candida issues for a while now, thinking about going on the GAPS diet. I tried the GAPS diet about a year ago and own the books. I blogged about your giveaway on my site where I also write about real food, homeschooling, and living on one income. Hi there – I ‘liked’ you on Facebook and the GAPS diet is totally grain free even no starches! I am so impressed with the GAPS diet and hope to get started on it using the Introduction Diet on the web site! Thanks so much for telling me about it! I follow you on Twitter and tweeted about this post, but I hope that I win! I emailed five friends and told them about this giveaway, but if they win they are going to have to share it with me! I like your new page on Facebook and posted about this giveaway, but I told my friends if they enter and win the book they will have to share it with me. I need it more than they do! 🙂 Thank you so much for having this giveaway!!! I shared about this giveaway on Facebook, but I hope that I win!!! Thanks!!! I have visited Gaps website several times trying to gain the courage to start the diet, I was hoping for an e-book that would help me break it down further….thank you for the opportunity to participate in this giveaway, I hope I win!!! I follow you thru Email and RSS! I visited the GAPS diet website and learned that supplementing probiotics and essential fatty acids are more important than taking a multi-vitamin. I ‘m a subscriber to your emails. Thanks. I was actually happy to learn that dairy is not included in this diet. I’m so sick of being told to consume dairy. I already subscribe to your weekly email newsletter. I already like you on FB and I shared this link on FB. I learned that stock, kefir and fermented vegetables can restore stomach acid production. Facinating! I learned that this diet can help Autistic child. This is great to know since I am a teacher who has autistic children in my classroom. I would love to win! I have been interested in learning more about this diet. I already subscribe to newsletter! I am emailing the giveaway to friends! I love the food list!!! I was wondering though about the rutabega?? I’m guessing it’s a no go… Thanks for the link!! If I don’t win I just might have to buy that book. Thanks so much for your great website and the fun contest. My family and I have been researching the GAPS diet for a few weeks now and I know and believe that this diet will heal your gut lining and allow you to actually absorb and use the food that you eat while not absorbing pathogens into your blood stream. I am extremely interested in the cookbook. WOW! How awesome. I’m always at a loss for what to cook. I always feel like I have to reinvent the wheel every week or two. Crazy. From the GAPS Diet website, I learned tips on how to simplify life on GAPS, especially while traveling. The tips help me GAPS seem more “do-able”. I would love to win the cookbook; I certainly need all the help I can get as I contemplate starting GAPS for my entire family. Book would be great for my grandaughter who has gut issues. I learned that high-fat dairy (ghee, sour cream) vs high-protein dairy (yogurt, whey) is better for treatment of chronic constipation. My husband and kids have been on GAPS for nine months now; I’d love to see the new cookbook! I’m glad to revisit the recommendations for feeding babies as my 7 month old is just starting to eat a bit, and broth is one of the only things she’s taking so far! I learned that headaches associated with high blood pressure are usually from a need for more Magnesium. I learned that nutritional yeast is GAPS legal! 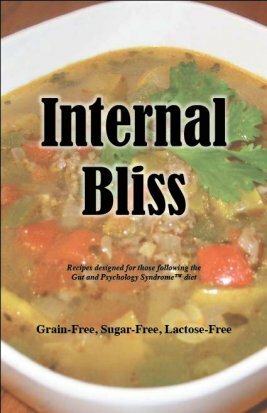 I’ve read the GAPS book… i first learned that the gut basically controls everything!!! Awesome book. Super excited for the cookbook! I like you on fb, I posted on fb, and I learned more about broths on the GAPS site. I signed up for weekly newsletter. I didn’t know that probiotics were suggested. Makes sense though, how a healthy gut is important! I learned that probiotics are very important for your digestive system. My brother has a problem with his stomach and none of his regular doctor has figure out what is the problem, they always suggest GERD or some other issue. However, when he eats soyogurt with 7 probiotics it does help him and he doesn’t know why. I am hoping to find out for him and let him borrow the book to figure out what’s the issues that makes his stomach upset. I am in the middle of reading the GAPS book (and saying “Yes that’s me the whole way through”). I am excited to see a cookbook. I learned that Dr. Campbell-McBride’s child had learning disabilities that improved on GAPS. I’m very interested in learning more about that. I learned dthat Dr. Natasha Campbell-McBride holds a degree in Medicine and Postgraduate degrees in both Neurology and Human Nutrition. clicked on the link. I learned that GAPS Physicians who support GAPS patients are listed on their website. Too bad there’s not one close to me on the list. I didn’t realize that you could eat so many fruits on GAPS – maybe I had it confused with Body Ecology?